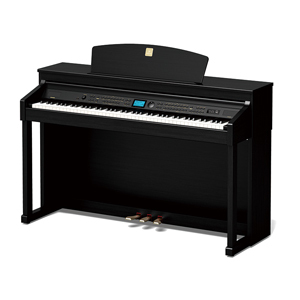 The DPR-3500 is the upright variant of the GPR-3500, which occupies considerably less space while retaining the full functionality of top-tier grand pianos. It implements deep and inspiring sound system close to the sound of quality pianos, and is equipped with the New RHA-3W keyboard for its haptic simulation of the acoustic grand. Its extensive auto accompaniment system features 80 different rhythmic styles in many musical genres and produces chords accordingly as well. Connecting to external devices are comfortably easy now that the connection terminals are gathered on the front of the panel.